I woke up today and it felt like any other recent fall day. Rainy and overcast. (We’ve had a lot of rain around here.) But later things brightened considerably when Jon presented me with a bunch of bright red tulips! Tulips are my favorite. Tulips and peonies. Special occasion? YES!!! Today is the 4th anniversary of Through Her Looking Glass. Somehow I’d forgotten, and glad he didn’t. He also gave me a winner card that said “When I think about what it means to be brave, I think of you.” And that was very kind and generous. Because I distinctly remember feeling considerably less than brave while pushing the publish button on that first post. And subsequent ones. Wondering if this thing would soar, or crash and burn. His card reminds me of Piglet. “It is very hard to be brave,” said Piglet, sniffing slightly, “when you’re only a Very Small Animal.” Piglet was always a wise little animal. I guess it was A.A.Milne who was truly the wise one. So it’s hard to believe the holidays are nearly here. YAY! (I think.) This is always my favorite time of year. I’m making lists and checking them twice. Maybe I’m just getting older, but it seems the days race by and Thanksgiving and Christmas come just a little faster every year. Do you remember those delicious foil-wrapped Chocolate Covered Cherries? We used to have them around the holidays at our house. Some kind, generous soul (with good taste!) would gift us with a box. Once they were open, they were nearly impossible to resist. That Black Forest combination of chocolate and cherries is the bomb! Last year I made some adorable little chocolate mice with chocolate kisses and homemade chocolate covered cherries. They are the perfect treats to add to Santa’s milk and cookies on Christmas Eve. 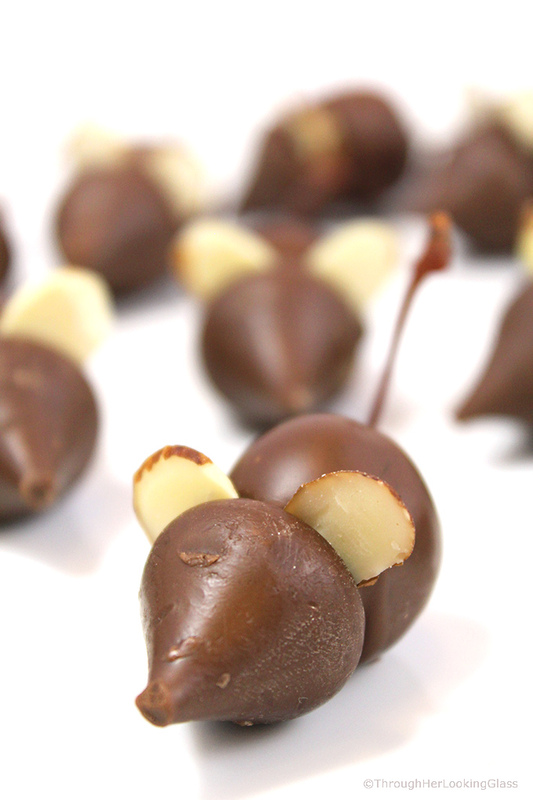 I had no idea how easy chocolate covered cherries are to make until I made those tempting little mice. Even though I love them, I had stayed away from maraschino cherries for years, knowing the preservatives and dyes used to make them are unhealthy at best. But recently I discovered some amazing natural maraschino cherries at Whole Foods. These Merry Maraschino Cherries by Tillen Farms have no preservatives or dyes or corn syrup. You can also buy them on Amazon. So now I’m happily using maraschino cherries in baking and treat making again. No guilt. If you don’t have coconut oil, use vegetable shortening or butter. Drain cherries, then place on paper towels to air dry for a bit. 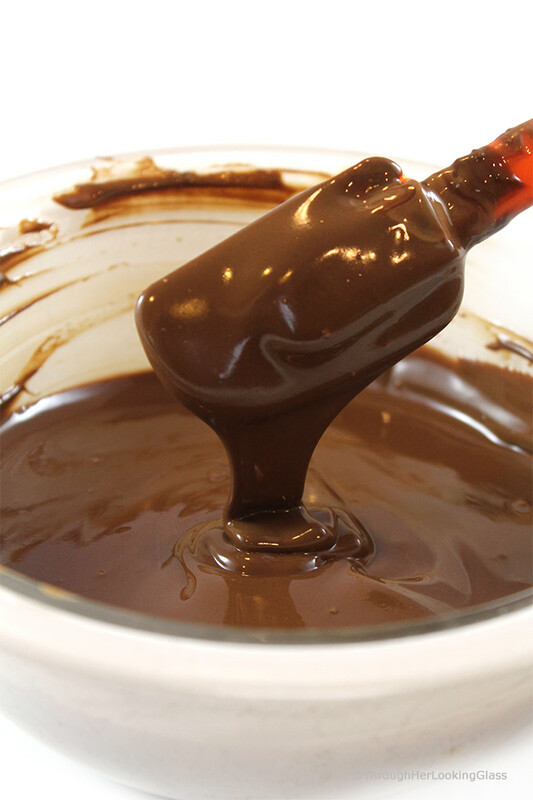 Melt chocolate and coconut oil over very low heat on the stove top so it doesn’t seize or burn. Or melt in the microwave on high power for 15 second increments, stirring well after each increment. Let dipped chocolate covered cherries dry on parchment paper, stem up. Optional: Soak overnight in rum, brandy or vodka for a delicious alcoholic version. Other recipes you might like with chocolate and cherries: Dark Chocolate Cherry Scones, Chocolate Cherry Fudge Bundt Cake and Chocolate Cherry Skillet Cookie. Or try this classic Cherry Garcia Ice Cream! 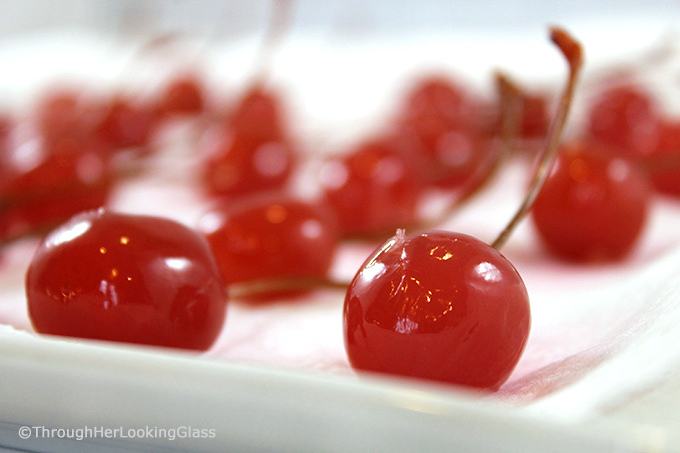 If using alcohol, soak cherries overnight in brandy, rum or vodka. Drain maraschino cherries and gently blot with paper towels. Lay cherries out on paper towels to air dry a bit. Separately, in the microwave or on the stovetop on very low heat, melt chocolate chips or chopped chocolate together with coconut oil. 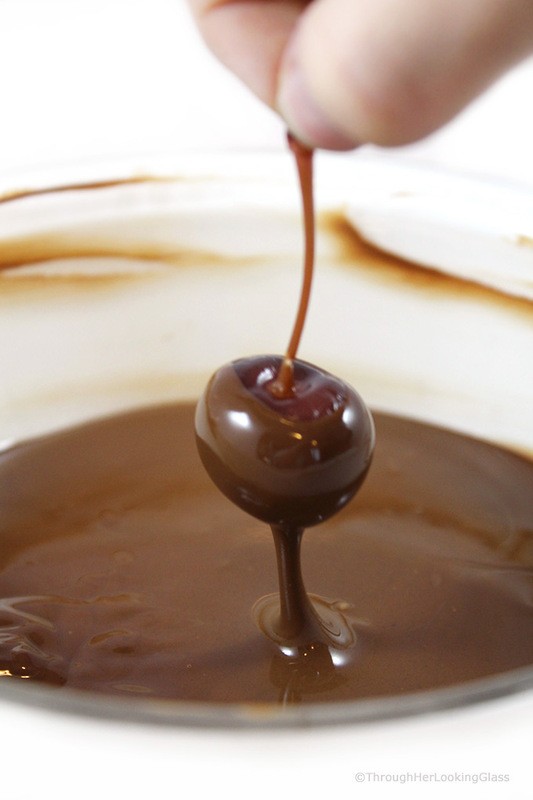 Hold dry cherries by the stem and dip into the chocolate mixture. 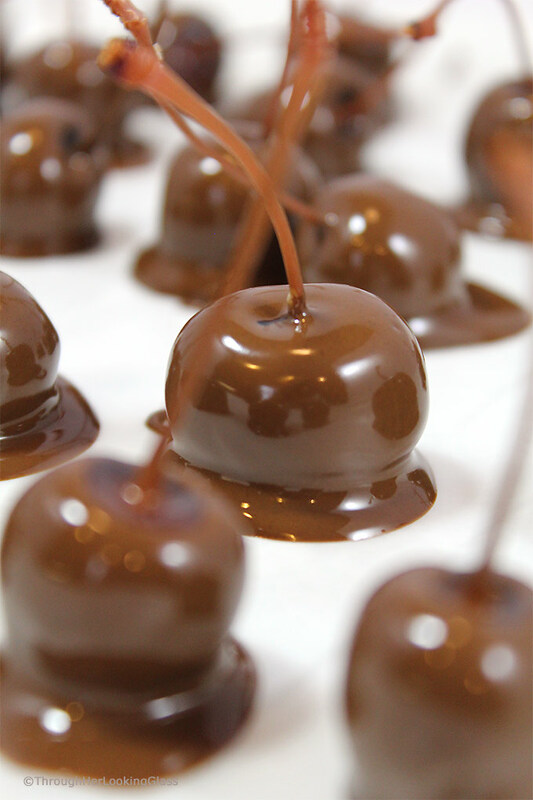 Place chocolate dipped cherries stem up onto waxed or parchment paper to dry. Reheat remaining chocolate mixture if needed. Allow to air dry or place in the refrigerator for a few minutes to hurry up the process. If you don't have coconut oil, use vegetable shortening or butter. Melt chocolate and coconut oil over very low heat on the stove top so it doesn't seize or burn. Or melt in the microwave on high power for 15 second increments, stirring well after each increment. What a sweet hubby! Congrats on 4 years! 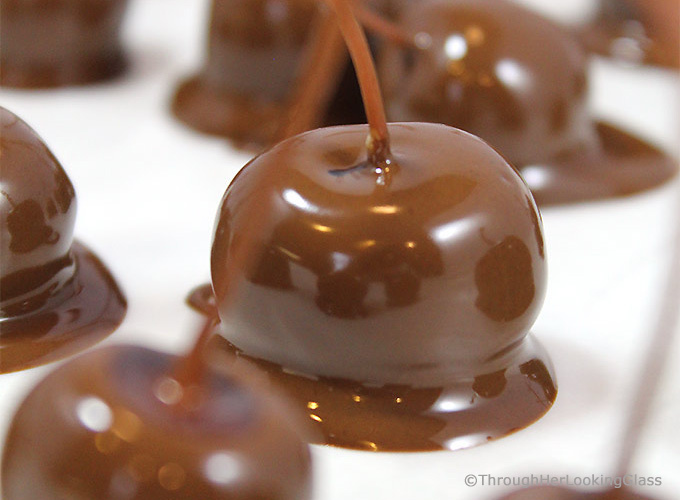 These chocolate covered cherries are the way to celebrate! They look scrumptious! Allie, These look delicious and so easy! I didnt know there were healthier maraschino cherries, so thanks for sharing! YES, time is flying by. Hope you and your family enjoy the holidays! 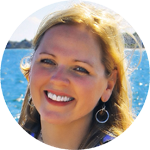 And CONGRATULATIONS on your 4-year blog anniversary!!! How very sweet of Jon to give you flowers on your blog's anniversary. I look forward to many more years of delicious posts from you. I did love those chocolate covered cherries and will definitely be try these...marinated overnight in some delicious liquor. Happy, Happy 4th anniversary! I truly believe the world is a much better place with people like you in it to inspire, inform and teach more than even your wonderful recipes that you so kindly share with everyone. Talk about "me,too" moments. Many of your posts sure hit home with me and I don't know what it was that made me start reading all your posts but I feel so fortunate to have found them. OK so now you are going on about these beautiful(and shall I say, my favourite sweet) maraschino cherries. I am going to look them up on Amazon ASAP, because I too don't care for polluting my body with harmful things, and after that I will hope to make these beautiful chocolate cherries. Did I mention that they are my favourite? Give me a Cherry Blossom bar and you have one happy person! I also remember reading somewhere that this chocolate coating is great for making hard shell ice cream creations with coconut oil. We are enjoying a wonderful extended fall here and I hope snow is holding off in your wonderful part of the world, too. I am seeing the news at times and looks like west Canada is snow laden already. Have a great weekend Allie! Many more years of lovely posts from you too! Doug is going to go crazy for these. I buy him chocolate covered cherries every Christmas. I can't wait to see his face when I make them for him.